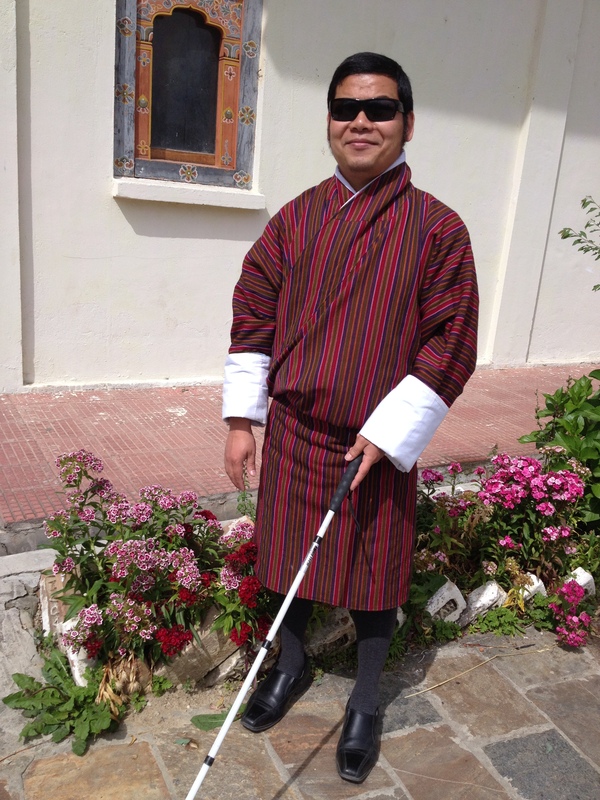 My brother-in-law, Santabir Rai, who is also a visually impaired, was once walking alone to his office when one of his colleagues called him from a distance. My brother-in-law answered back while walking but it seems he heard another person telling his colleague not to disturb him because he might lose the count of his footsteps. I know it sounds funny but even if I were a sighted person, I too might have had the same notion when I see a visually impaired person walking independently and that too, without a white cane. Until a couple of years ago, I wasn’t using a white cane which I am using now. When I was in school, nobody used the cane and we all walked to Khaling high school and back to Muenselling Institute everyday independently. So, in this article, I shall try to explain how we the visually impaired persons normally navigate our way within the familiar environment. Going out of the house and walking a longer distance requires a few more techniques. Before I went for further studies in 2012, I used to walk to and from office on my own but after narrowly escaping getting hit by sppeding cars twice, I had to stop to walk alone. But except for the traffic at the Swimming Pool junction, I had no other problems walking independently. Most people wondered how was I able to find my way. There are certain landmarks and clues we should remember while walking outdoors. The landmarks hardly change because they are more or less permanent structures on the way and they help us identify exactly where we are and which direction to turn to after that. For instance, when I was walking to office from my house which is beside Kelki High School, I used to walk up to the Swimming Pool highway from the left-hand side of my house and take the footpath that runs just above Kelki High School. The electric poles on the side of the sidewalk were my landmarks. After the third pole, I would cross the road, up to the divider and continued forward to cross over to the sidewalk on the other side of the highway. Then the small stream of drainwater at the Swimming Pool Junction was a clue that indicated that I have reached the road that leads to my office. The clues can change but they can always indicate important signals such as the sound of drainwater flowing, roaring engines of the approaching cars, etc. So the first thing a person should remember while orienting a visually impaired person is to identify such important landmarks and clues at crucial points so that he or she can navigate easily. And Nature has been so kind that I haven’t yet found any place without any identifiable landmark or clue. On my way from my apartment to my university in Australia, I had to cross a large car park where at first, I could not find any significant landmark or clue that could guide me straight to the other side of the parking lot to continue to the narrow path that followed. But after a few re-orientation, I discovered a slightly elevated line at certain points across the parking lot, following which, could lead me to the other side, to the right direction. I didn’t have any problem navigating in and around my university. Now even my wife and some friends know how to provide mobility orientation to visually impaired people. In fact, it was my wife who identified important landmarks between my house and my office. So, landmarks and clues are everywhere, which means there is hardly any place where a blind person cannot go. We can certainly see through our ears, nose and touch, but the white cane, a mobility stick for the blind is the lifeline. Wonderful post, Sir. Just loved going through it. In fact, it brought insight into your life - how a visually impaired person takes on the world around him. Keep writing and inspiring us, and of course a wonderful holiday! 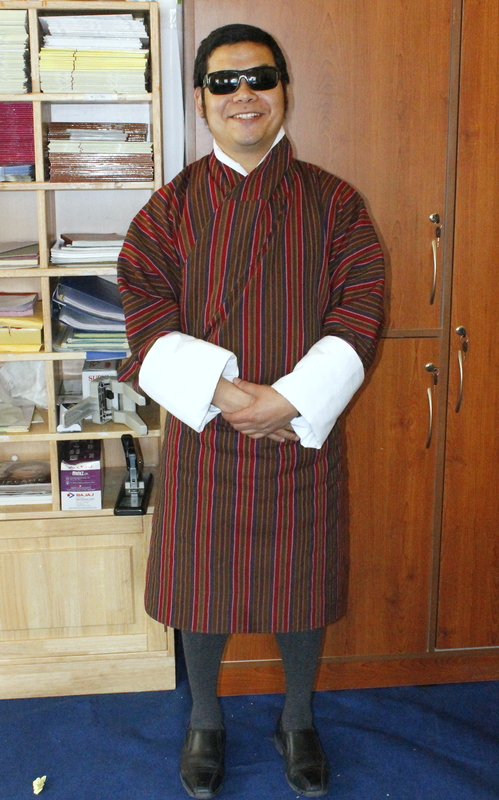 I am a teacher of Samtse HSS and an amateur blogger. I derive so much inspiration form your blog posts la. There are so many interesting articles which many sighted people must read. I really admire your blogging flair la. The present post is really insightful la. Now I know how visually impaired people work their way. I have a question for you la. When we close our eyes we see darkness. Do you also see darkness? I hope you will not mind me asking that question la. Looking forward to reading your next post la. Thanks Tshewang sir for your comment. With regard to your curious question, I don't know how others feel but to me, closing eyes does not make any difference in terms of darkness or brightness, because I no longer feel darkness. I still remember during the first few months of my blindness, it was suffocating and everything was dark. but you know, our human brain is so flexible that after sometime, it becomes normal and no more darkness. So, closing eyes does not create more darkness at least to me. But when I meditate, I must close my eyes to focus more and concentrate more. Thank you so much, Riks. Your comments are very encouraging. Oh, m so sorry. I should thank you for taking the photograph. lol!